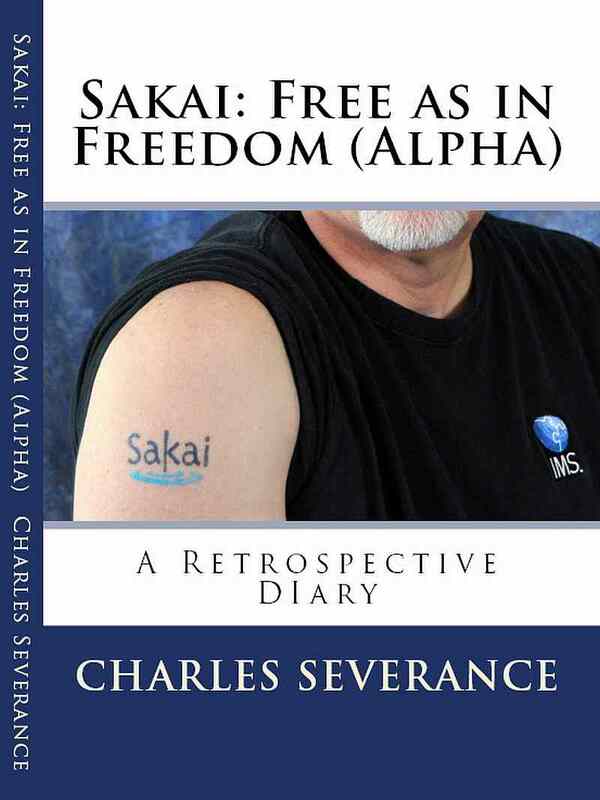 Sakai: Free as in Freedom, written by Charles Severance (the first Executive Director of the Sakai Foundation) is a personal view of the history of Sakai. The book is a thorough description of how the project and its software evolved. This is not a book about software configuration; it is a book that describes how a community emerged from the actions of individuals. Sakai CLE is a popular Learning Management System composed of more than a million lines of Java code. Sakai is open sourced under the Educational Community License. Students from well-known Universities such as Michigan, Indiana, Cambridge, the University of Amsterdam and around 360 active organizations use the software daily. The Sakai Foundation, which is a non-profit organization, encourages community building. The product is described as community sourced due to the emphasis on partnership between academic institutions, non profits, and commercial organizations. Charles Severance was the first Executive Director of the Foundation and is well placed to write this historical account of events. Charles Severance is energetic, leading the troops from the front and setting an example by debate then action. Because of his on-going and vigorous participation in the development of Sakai, the book clearly shows his thorough and deep knowledge. The book maps the twists and turns that lead to the present day and the hidden compromises. Sakai: Free as in Freedom discusses how the project evolved to deal with the intrinsic pressures and contradictions developing mission critical software. The authors’ personal style puts you right at the centre of the maelstrom. The authors’ personal style puts you right at the centre of the maelstrom. Containing 240 pages and 26 chapters this is a comprehensive first person view of the major events in the history of Sakai. The author has seen the whole spectrum, starting with the decision of a number of well-known Universities to merge their code bases to make a better Learning Management system. From the rapid pace of getting software ready to ship, to a maturing International community. Honest in his mistakes, frank about where things could have gone better, Charles Severance systematically navigates the reader. Notable land marks include getting lost while flying, a patent infringement case with Blackboard, some significant in-house fighting and the general stress and strains of keeping production software running, while pushing forward with an aggressive roadmap of feature changes. The book also gracefully highlights how well the individuals involved worked together despite the daily wear. This book is for anyone interested in the social dynamics of a large free software community. It is also almost required reading for resource managers, department heads and decision makers getting themselves involved in Sakai for the first time. This book is about the spirit of free software, how a community emerges by incremental decision making. It represents a snapshot of the good and the sometimes not so good of working in the real world with community source. This is a very human story. I find the most interesting part of open source development is the community you find yourself. Sakai: Free as in Freedom captures the spirit and challenges of one of the larger and active communities. The book cover showing Charles Severance Sakai tattoo demonstrates his commitment to the long term health of this project. Charles passion and in-depth knowledge is expressed clearly in the text. I have reviewed a pre-release version of the book; there were still a small number of typos which I expect to be cleaned up in rapid order before final publication. If you are looking for a book on how to install and run Sakai then this is not the book for you.